During the early months and years, babies are developing at a rapid pace and their awareness of the world around them is changing all the time. Here we explore the changing awareness your baby has of other people. Even before they are born, babies have a degree of awareness. Whilst they’re still developing in the womb, they are aware of your voice and of other noises, such as loud music. In the womb they’re also aware of their mother’s heartbeat and, once born, enjoy being held and cuddled close to the chest, where they can hear the reassuring sound of your heartbeat once more. During the first six months of their life, much of a baby’s time is spent feeding, having nappy changes, sleeping and crying. In fact, crying is the major way in which they try and communicate their needs. At this stage, although babies may appear to have little awareness of much of what is going on in the wider environment around them, they are very aware of their parents and those that are caring for them. 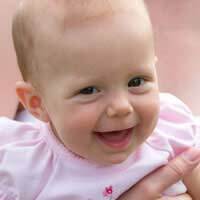 In the first three months, babies don’t have full awareness of all the colours around them, but they do have a good sense of hearing and are able to use hearing as a way of observing and making sense of the world. How you talk to your baby is important; speaking gently and lovingly offers much reassurance and there’s a lot to be said for gentle baby talk. Talking gently with feeling is important for everyone holding and looking after your baby, as they can pick up clues about emotions and the mood people are in. Throughout the first few months, they’ll be learning the basic sounds of language and, as they develop further, will begin to recognise language more and respond to their name by smiling and other interaction. As our baby reaches the four to six month stage, they’ll gradually develop an increased awareness of colour and will be able to identify more people and other elements of their surroundings. At this stage, they move from primarily basing their awareness on their sense of hearing, to learning more by their ability to feel textures. A lot of their sense of texture is gained from feeling things with their tongue – which is one reason why your baby may gravitate towards putting anything and everything into their mouth! He’ll also now be able to turn towards sounds and will carefully watch your face and other people’s faces when you’re talking. Given half a chance, he’ll also be keen to try and copy your facial expressions and mannerisms too. Babies have a lot of interest in what is going on around them and that includes other people and what they’re doing. It’s good to encourage early social interaction, both with other babies and children and adults and being able to feel comfortable in the presence of other people is great for young babies.